23 03 2006 - Ullock Pike, Long Side, Carl Side, Skiddaw and Bakestall with Paul D and the dogs. 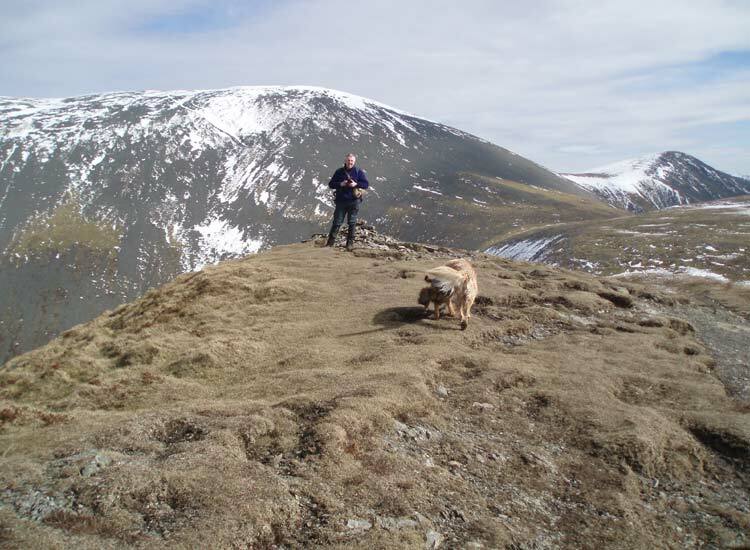 We parked near High Side and followed the path onto The Edge, climbing to Ullock Pike, Long Side, Carl Side and Skiddaw before descending via Bakestall. It was a fine day free of rain. Clouds kept high throughout the walk and visibility was good although distant views were not that clear. Skiddaw's top was cold but sunny and covered with ice and snow. Much snow also still lay on all the high tops adding to the grandeur of the surrounding fells. We finished the day with a splendid pint or two of Jennings' Cocker Hoop at the The Traveller’s Rest Inn near Grasmere.